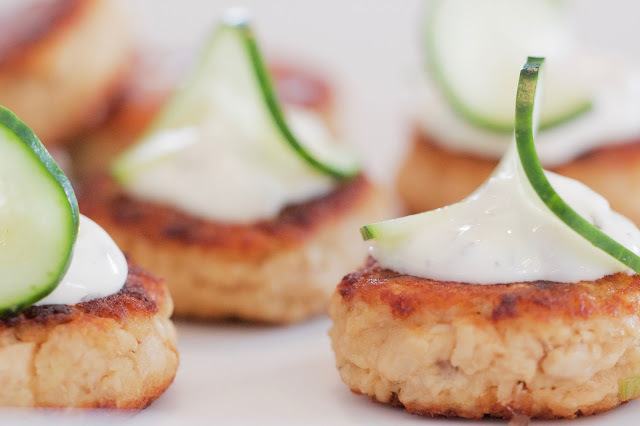 These Salmon croquettes are a perfect example and are easy enough to make for any upcoming game or party. You can even freeze them and pull them out as needed. 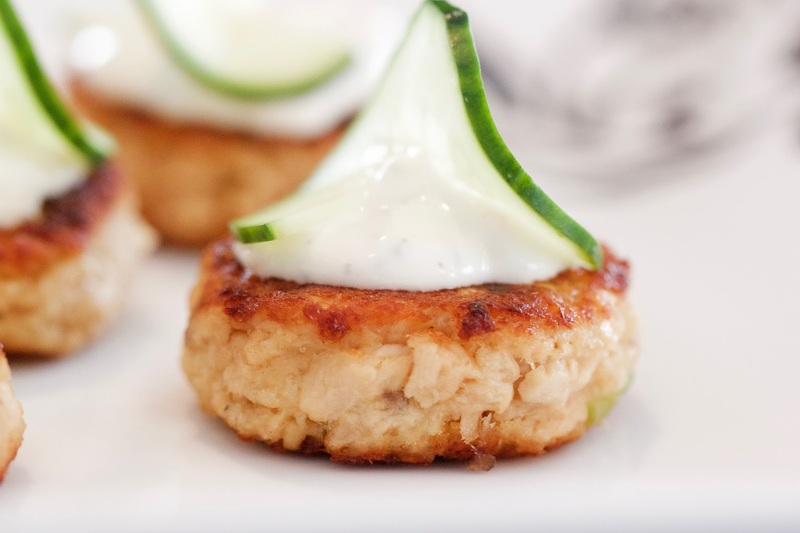 They've got tons of flavor and feature Sabra's Farmer's Ranch Greek Yogurt Dip both in the patty itself as well as dollop on top for a garnish. The Farmer's Ranch is a great substitute for your traditional Ranch dip but it's way healthier with 75% less fat and 60% fewer calories. Win-Win. If you're not a fan of Salmon, you could also easily change it up with shredded chicken or tuna. If you're up for trying this or just need some more great Sabra products for the game, check out the Buy, Snap Score Promotion where if you buy Sabra and Stacy's together before 2/15/16 you'll score a $5 gift card! And for even more great recipes check out the Dip Zone! In a large bowl whisk together the egg, greek yogurt, lime juice, chili sauce, garlic and ginger. Add the salmon and remaining ingredients and stir until combined. Using a standard cookie scoop, form balls from the mixture and flatten into a uniform patty. Freeze the patties for 20-30 minutes. Patties can also be frozen completely at this point for future use. In a large skillet, heat 2 tablesppons of oil over medium high heat. Add 4-5 patties to the pan and cook until golden brown on one side, 2-3 minutes. Flip and cook until golden brown on the other side, an additional 2-3 minutes. Remove from pan and cool on paper towels. Serve warm or at room temperature. 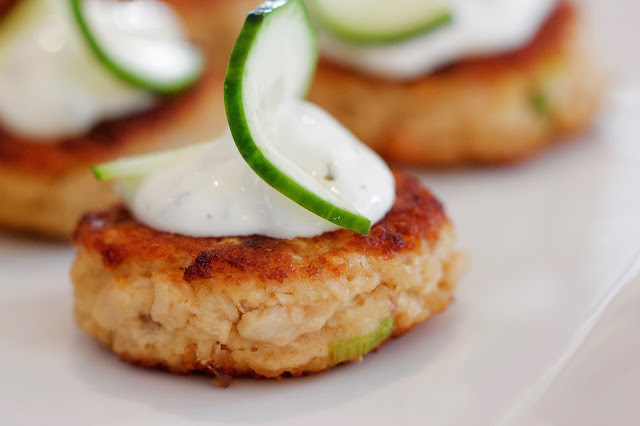 Garnish with a small dollop of greek yogurt dip and a thinly sliced cucumber if desired. Disclosure: I was compensated by Sabra for this post as part of the Sabra Taste Makers program. All opinions are my own.